Are dental implants different from dentures? A dental implant is a titanium screw that is placed into the jaw bone that will now serve as a permanent root for a missing tooth. After this new root has fused with the bone, Dr. Palani will then place a crown on the implant, providing you a tooth that looks and feels like a natural tooth. Dental implants give the patient who is missing a tooth a permanent tooth that looks and feels just like a real tooth. When you have a missing tooth it can cause bone loss in your jaw, it can cause other teeth to shift and move in your mouth, it can cause problems with chewing and speaking, and it is something that you are always aware of, altering your level of confidence. 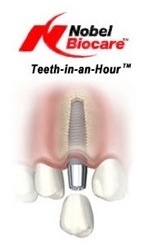 Dental implants are a permanent fixture that feel and look like your regular teeth. Dentures are removable and can often feel bulky, making them difficult to get used to. An implantologist, like Dr. Palani, who is trained in cosmetic dentistry, should perform the procedure. Don't take shortcuts when it comes to this procdure. The price will vary based on how many implants you are having placed, insurance coverage, and what preparation work needs to be completed. Schedule a consultation with us at Total Smile Care to determine a price for your implants and a financing plan if necessary. No, it will not hurt. A local anesthetic will be given before the procedure so that you do not feel any pain. If you have fear or anxiety you should discuss sedation options with Dr. Palani. Implants, if taken care of properly, should last a lifetime. Regular oral hygiene and dental office visits are important to the success of your implant.